SuperPros vertical pivoting bushes provide a perfect example of how replacing or upgrading a standard rubber component with a polyurethane equivalent can provide a series of significant benefits. Especially those found in modern-design suspension systems and specifically, the front control arms. SuperPro duro tester lets you “FEEL” the difference – literally! It always pleases me that no matter where I go, our durometer or hardness tester is a hit. Whether it be at a trade show in Melbourne Moscow or Las Vegas – everyone just loves to have a feel! Not only do they feel the duro or hardness, they actual get to feel the products themselves. 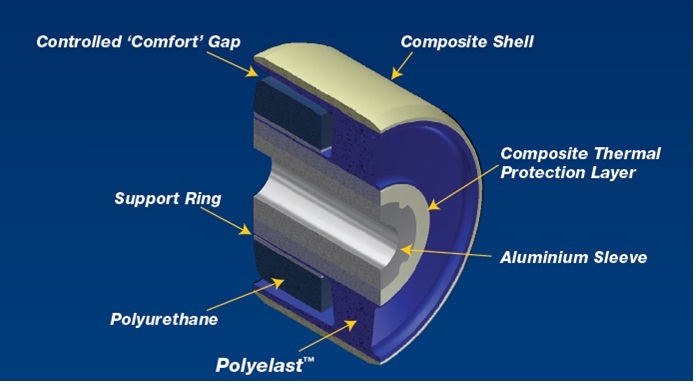 Polyurethane bushing are key to the vehicle handling and durability but some brands have historically provided a hard uncompromising ride. The reality is some polyurethane bushings last no longer than rubber and are "hard" work while in service. Caster and what does it mean? Your cars left or right pull will be extremely noticeable on any highway or when you are driving fast on a straight. Having misaligned wheels and the wrong camber, caster or toe adjustment is huge safety risk not just for yourself but for the others on the road. If you ever have work done on your cars suspension then you will also need a wheel alignment as any adjustment to your cars suspension system will displace its camber/caster/toe adjustment. If a wheel alignment is done properly it will make driving your car so much more pleasant and safe. Here are some pics from the event and there will be more to follow however, stand by for some surprising news on the outcome and what SuperPro parts were fitted to achieve it. Follow the links to see what APR Australia can do for VAG tuning. A very potent upgrade. 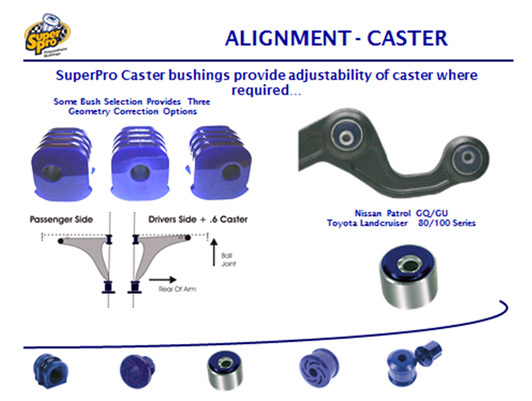 As for SuperPro parts, both cars had the full suite of poly bushings including performance caster correction kits as well as some new roll control products. Stay tuned for more details and look out on your news stands to get a copy to see the full details. 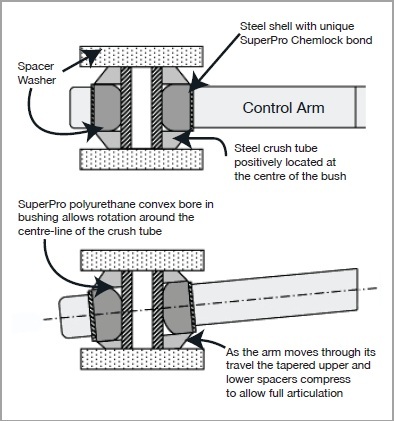 Twelve months of extensive research and development has gone into SuperPro’s bushing grease – specifically engineered to compliment the already outstanding performance of our polyurethane suspension bushes. The environmentally-friendly grease requires sparse application, making it cost effective to user. It offers nil-penetration into polyurethane, resulting in zero breakdown of the bushing, in turn providing consistent lubrication and exceptional wear-life. When installing any SuperPro polyurethane unit into a vehicle it is important to use SuperPro lubricant, this ensures a smooth ride and reduced NVH (Noise Vibration Harshness). The new SuperPro lubricant is designed to work seamlessly with the SuperPro materials self lubricating properties ensuring the unit is constantly provided lubrication as required. The new SuperPro grease is now supplied in stronger split resistant packaging with full safety specifications for consumers. Made in Australia, does it really matter? That’s a great question that we’re really forced to think about nowadays. Its also a question I get asked a bit as more and more product is manufactured off-shore with cheap labour sources and our customers wonder if SuperPro has gone the same route. These coil spring spacer kits are designed and used as a load carrying aid in coil sprung vehicles to restrict the compression of a single wind of the coil spring and thereby increasing the rate of the coil. These universal application parts can be adapted to a large range of vehicles.